Preheat oven to 400F degrees. Butter a 2½ quart baking dish and set aside. In a large heavy bottomed pot, steam cauliflower florets for 5 minutes, or until fork tender. Remove from pot and set aside. Leave the pot on the stove and reduce the heat to medium. Sauté Speck until lightly browned, about 3 minutes. Remove and set aside. Using the same pot over medium heat, melt butter. Once melted, whisk in the flour and cook for 1 minute. Gradually whisk in the milk and cook over medium heat, whisking constantly until mixture thickens. Whisk in the cheese and mustard, whisking until the cheese is fully incorporated and the sauce is smooth. Taste the sauce and add salt and white pepper as needed. 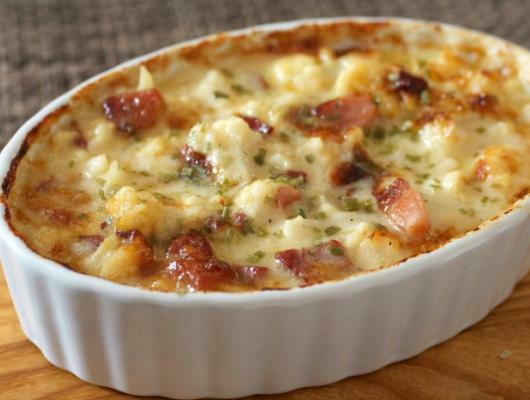 Stir the cooked cauliflower and speck into the cheese sauce and place the mixture in a buttered baking dish. Bake at 400F for 20 minutes or until bubbling hot. Serve hot as a side dish or as a main dish with a salad or green vegetable. Enjoy! 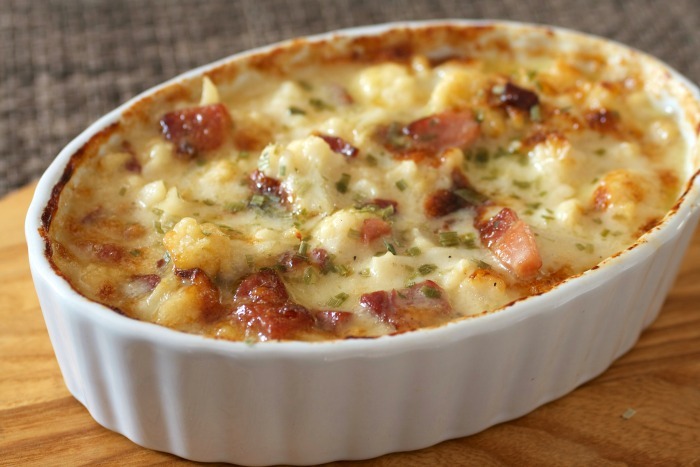 Smokey speck and sharp cheddar cheese give this Speck Ham Cheesy Cauliflower dish a wonderfully complex flavor. Serve as a side dish or as an entrée with a green vegetable or a salad. Can also leave out the speck for a delicious vegetarian option.